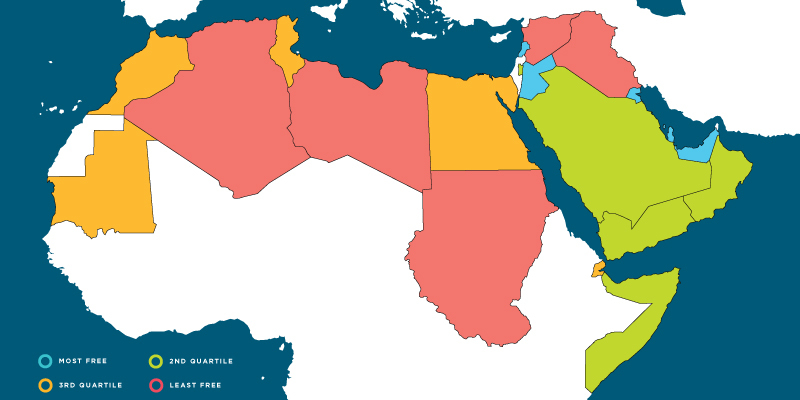 The Arab world faces a huge challenge. Although the Arab Spring undoubtedly had a political impulse, in large measure it was driven by economic concerns: sky-high unemployment, particularly for youth; under-employment and lack of quality in the jobs that are available; elite control of the economy; economic exclusion; cronyism; and corruption (see, for example, Amin et al., 2012; Malik and Awadalla, 2011; and Sidahmed, 2014, Feb. 23). Sadly, although several nations have implemented limited political change, with Tunisia being the most successful, little if any economic reform has occurred and some nations have back-pedaled on economic policy, as the data in this report shows. The chronic economic problems that plagued the region remain in place. Even the Gulf States face immense challenges in providing quality employment in the face of population growth, the “youth bulge”, and declining oil and gas prices. As Amin and colleagues argue (2012), for the future to be better than the past, economic reform is essential. Successful political change hinges on economic success and economic freedom for all people. If people are excluded from opportunity and hope, stability and democracy are illusive. Arab and Islamic societies have a rich trading tradition, one that celebrates markets open even to the humblest members of society. Economic freedom is consistent with that proud history and provides a path to a more prosperous and freer tomorrow. Economic freedom is simply the ability of individuals and families to take charge of their fate and make their own economic decisions—to sell or buy in the marketplace without discrimination, to open or close a business, to work for whom they wish or hire whom they wish, to receive investment or invest in others. As discussed later in this report, economic freedom has a proven fact-based record of improving the lives of people, liberating them from dependence, and leading to other freedoms and democracy. Unfortunately, many in the Arab world believe their nations have already gone through a period of free-market reform and that it hasn’t worked. This misconception deprives many of an economic alternative and vision for the future. In fact, reform was frequently phony. Economic “reform” before the Arab Spring was all too often crony capitalism dressed up in the language of free markets. In many nations, it simply replaced elite control of the economy through government with elite control through crony capitalism—handing off state assets, monopolies, and other rent-seeking opportunities to friends, supporters, and relatives of the regime. Rather than releasing entrepreneurial drive, it protected privilege. The data in this report show little progress in increasing economic freedom during the supposed period of “neoliberal” reform. Instead, the old structures largely remained in place and mostly still remain in place. It is our hope that the empirical measure of reform and economic policy in this report will help provide a path for reform and accountability, enabling people to determine whether progress in policy reform is real or illusionary.